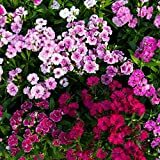 Dianthus chinensis growing herbaceous of the genus Dianthus also known as China pink or Dianthus caryophyllus, Dianthus chinensis perennial evergreen or annual in cold climate used as ornamental plant, can grow in tropic, mediterranean, subtropics or temperate climate and growing in hardiness zone 4+. 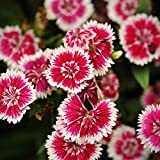 Flower color pink, white or red can be more than one color, the border sometimes prominent in stronger color, the flower has five petals with jagged edges. 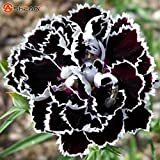 Organic Flower seeds Carnation Chinese Kianty (Dianthus chinensis). Pink, white or red can be more than one color, the border sometimes prominent in stronger color.